A month ago a Fortnite fan managed to datamine some of the in-game resource files which pointed at the inclusion of a new revival mechanics, but it was not specific as to how this new reviving the teammate feature work in the Fortnite title. 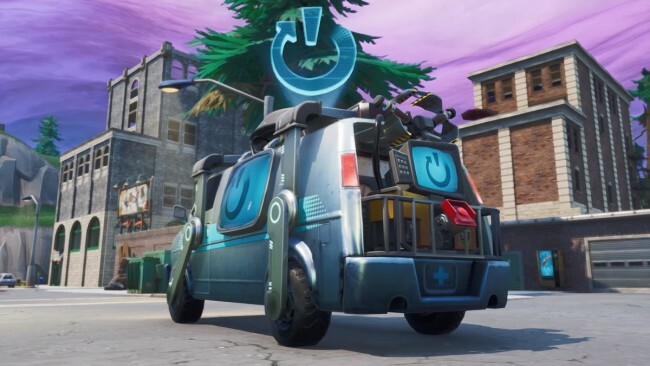 Now with the official confirmation, Epic Games have revealed the actual function of the Reboot Van and how this new object in the title can bring back the dead squadmate. Many Battle Royale fans could easily relate to this new reviving function form the latest free to play shooter title Apex Legends. The Respawn’s most recent Apex Legends featured a reviving bus where players had to use the killed teammate’s item card and revive him. In similar fashion Fortnite’s new Reboot Van can resurrect the killed teammate and bring them back to life in the game. A video was shared on the official Twitter handle of Fortnite which showed Banana Man reviving his teammate by picking up his item card from the crate and rushingly inserting the player card into the Reboot Van. Within a few seconds, the Banana Man’s friend revives and joins the team while all other three team members celebrated the resurrection by dancing and using funny emotes. An interesting thing to observe is that the revived teammate would also be provided with a Pistol having 36 light ammo and 100 Wood resource to build a critical defensive structure. But the Reboot Van and the Reboot Card feature would not be available in any other Limited Time Mode, Solo battles and any other event which has Reboot Van disabled during the match. Another essential thing to keep in mind while reviving a teammate is that players will only have a total of ninety seconds from the point when a teammate gets killed in the match. As soon as a player gets killed, his teammates will have only ninety seconds time frame to collect the down players Reboot Card and insert it into a Reboot Van nearby which are scattered across the Fortnite in-game map. This makes reviving a teammate extraordinarily challenging and time-bound task, but surely it would help in building a much more reliable squad who would risk it all for their teammates. Moreover, a much more synergy would be observed amongst the different team members, and much more challenging combat could be possible as players could revive a downed teammate after killing the enemies. Surely some gamers would criticize Fortnite of replicating its opposing title; still, we can see how Fortnite has added a tinch of twist to a whole reviving concept, so players should form up some reliable and trusted team members who can help you relive the Fortnite experience even after getting killed. Aida Martin is a Microsoft Office expert and has been working in the technical industry since 2002. As a technical expert, she has written technical blogs, manuals, white papers, and reviews for many websites such as office.com/setup. How to Renew Subscription and Get McAfee?